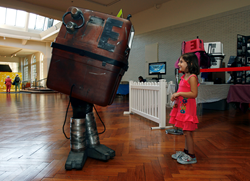 Maker Faire Detroit returns to The Henry Ford on July 25-26, 2015 with new makers already confirmed, a new outdoor midway location and new craft partners Handmade Toledo for the family-friendly event showcasing the amazing work of makers of all ages. Inventors, tinkerers, hackers and do-it-yourselfers looking to participate in this year’s faire can now apply at http://www.makerfairedetroit.com/call-for-makers until the June 1, 2015 closing date. For the event’s sixth year, The Henry Ford will be moving the faire’s outdoor midway location from the front of Henry Ford Museum to the Lovett Hall lot located behind the museum. The new location provides guests more convenient parking opportunities and easier access to makers located both inside and outside the museum. New for 2015, fans of celebrity modder Ben Heck can submit their creations for a chance to be featured in “The Hacktiques Road Show,” sponsored by the element14 Community. Chosen makers will be invited to the element14 booth on July 26th at Henry Ford Museum to show off their projects on camera with Ben and possibly be featured in an upcoming episode of element14’s The Ben Heck Show. All hacks are welcome and individuals or groups are encouraged to apply online at http://www.element14.com/tbhs. Also making its Maker Faire Detroit debut this year is Cirque Mechanics. Inspired by the modern circus, Cirque Mechanics is known for its unique approach to performance, inspiring storytelling and innovative mechanical staging through acrobatics and a bit of clowning around. In addition to new makers, Handmade Toledo has signed on to present the handmade arts and crafts portion of this year’s faire. For more information, visit our website at http://www.makerfairedetroit.com or on Facebook at http://www.facebook.com/makerfairedetroit. Maker Faire Detroit is independently produced by The Henry Ford in collaboration with Maker Media. The Henry Ford in Dearborn, Michigan is an internationally-recognized cultural destination that brings the past forward by immersing visitors in the stories of ingenuity, resourcefulness and innovation that helped shape America. A national historic landmark with an unparalleled collection of artifacts from 300 years of American history, The Henry Ford is a force for sparking curiosity and inspiring tomorrow’s innovators. More than 1.6 million visitors annually experience its five attractions: Henry Ford Museum, Greenfield Village, The Ford Rouge Factory Tour, The Benson Ford Research Center and The Henry Ford IMAX Theatre. A continually expanding array of content available online provides anytime, anywhere access. The Henry Ford is also home to Henry Ford Academy, a public charter high school which educates 485 students a year on the institution’s campus. In 2014, The Henry Ford premiered its first-ever national television series, The Henry Ford’s Innovation Nation, showcasing present-day change-makers and The Henry Ford’s artifacts and unique visitor experiences. Hosted by news correspondent and humorist, Mo Rocca, this weekly half-hour show airs Saturday mornings on CBS. For more information please visit our website thehenryford.org.